thebahamasweekly.com - Bahamas National Culinary Team Brings Home the Gold! 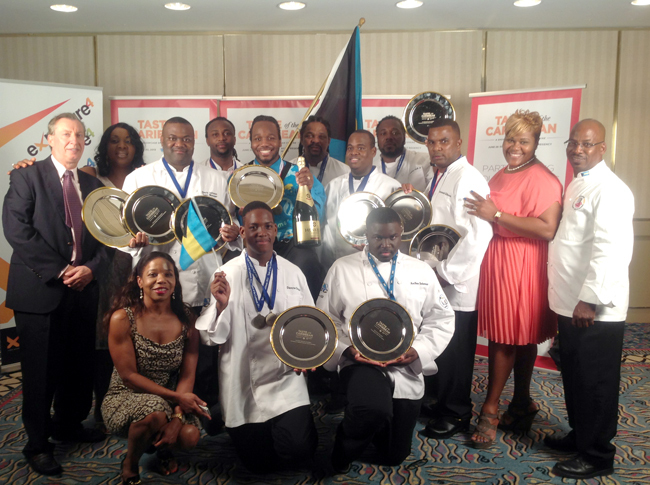 Bahamas National Culinary Team Brings Home the Gold! Team Bahamas displays hard-earned rewards at Taste of the Caribbean in Miami. 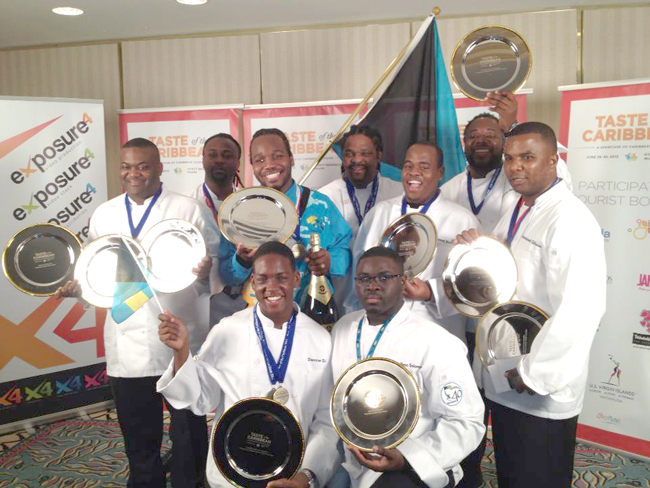 The Bahamas National Culinary Team is bringing home a record haul of honors following their outstanding performance at this year's Taste of The Caribbean competition in Miami, Florida. The Bahamas captured team gold and several top regional and individual honors in the 20th anniversary of the prestigious regional event held by the Caribbean Hotel and Tourism Association. "We are extremely proud of what our chefs have accomplished, particularly this year as our nation celebrates its fortieth year of independence. Their results show how far we've come as a nation in developing our people and their culinary talents," said a joint statement issued by Minister of Tourism Obie Wilchcombe and Bahamas Hotel and Tourism Association President Stuart Bowe. BHTA, the Ministry of Tourism, and the Bahamas Culinary Association host the team annually. Chef Sheldon Tracy Sweeting set a Bahamas record when he was named the Caribbean's Pastry Chef of the Year for the second time, a distinction which regionally has only happened once before regionally. He was also inducted into the Taste of The Caribbean Hall of Fame for his achievements. Rounding out the team's performance, Chef Ron Johnson also received a bronze medal in the seafood category. Bahamian Chef Ancilleno Solomon from Luciano's also received a bronze medal in the ice carving competition. Chef Simeon Hall Jr did not compete in any individual categories and served as an integral part of the team and their success. Team manager Chef Devin Johnson praised the team members for their accomplishments. "This is a very special group of professionals who showed great determination and skills, particularly over the past six weeks. They trained hard, starting last fall. Their hard work and focus paid off". In addition to support from BHTA and the Ministry of Tourism, the team's participation was possible through corporate sponsorships. This year's major sponsors are: the Bahamas Telecommunications Company, Bahamas Food Services, Bahamian Brewery and Beverage (Sands beer), Royal Bank of Canada, Bahamasair, the American Hotel Register, Bristol Wines and Spirits, the One and Only Ocean Club, Atlantis, the Sheraton Nassau Beach, Luciano's of Chicago, and the Lyford Cay Club.